Turns out you don’t need as much room to throw a little dinner together as I thought. 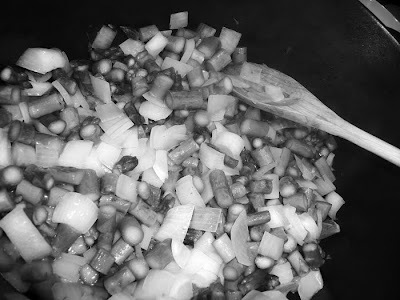 When you saw that pan full of asparagus, onions and garlic did you think the tornado had cleared? Did you even remember a jewelry tornado had attacked my kitchen? No? Don’t feel bad (DID you feel bad?). I never remember to add the links in my emails (did it twice today). I even accidentally send texts to my daughter forgetting the actual ‘text’ part. I do this one ALL THE TIME. This doesn’t drive her crazy at all. I also call my wireless cell earpiece, my “Blueray” instead of my “Bluetooth” because I can never remember which one is correct. Still not sure to be honest. Therefore, I absolutely do not expect you to remember anything about my kitchen or lack thereof. While we’re on the subject, I am terrible, and I mean terrible, at remembering people’s names. Strangely, however, I have never forgotten a face. If you sat in the back row of my Anthropology class in college (a million years ago), I will remember that I’ve seen you before. You may have only glanced up at me one time but if we locked eyes for even a moment, your face is forever imprinted on my brain. It’s a weird thing with me, freaks my husband out. He’s been trying to figure out how we can parlay this little gift into a fortune. I’ll let you know if that ever pans out. I like to think I remember important things and simply don’t waste brain space with the less important stuff (not that one's name is "unimportant"). At least that’s what I tell myself – makes for a happier little world. Whether it's space on the counter tops, or space in my brain, it's all at a premium around here. I do remember I have Celiac disease. It is really important to remember that fact at all times or I get to feeling sick. Yep, this girl is gluten free. 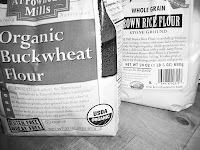 Those are some of my flour alternatives. I was experimenting with the asparagus soup last night to see which one would be a better thickener. I did think one was better than the other, but for the life of me I can’t remember which one. Back to the kitchen (forgot what I started telling you – see what I’m sayin’ here?). Everything is still in there, but the vintage jewelry with all the little sticky notes has just migrated up to higher counter space so I could cook some dinner. Really needed some fresh home cooked food last night because that’s how we usually roll around here and I’ve missed it this week. The photo above is our dinner from last night. 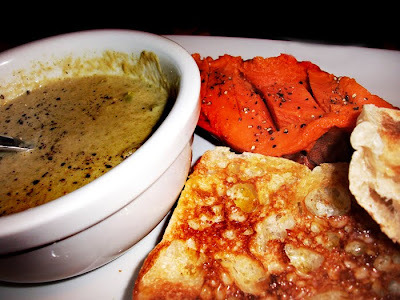 We had asparagus soup, baked yams, and crispy, toasted, artisan bread. Well, ONE of us had bread. Yummy bread. My taste buds would love (and I mean LOVE) that bread. My stomach has different ideas. That is a photo of Andrew Henry's plate. I don’t deprive Andrew Henry of gluten. Andrew Henry is my husband. His name is not Andrew Henry. His name is not Andrew. His name is not Henry. This is just how I refer to him. Look at this fancy-schmancy olive oil I poured over everything (that is not butter up there on Andrew Henry's bread it's this wonderful stuff). 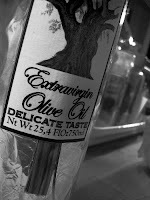 The oil was a Christmas present from my very chic friend Ewa. She gives great gifts that girl! I kept forgetting it was in the cupboard (pattern?) so now I keep it out on the counter. Maybe all that jewelry isn’t the only reason my counter space is at a premium. I picked up my dinner at the grocery store, an Amy's Veggie Lasagne. Wish I lived at your house, that meal looks like something that would be served to me at a fine restaurant! I wish I could remember faces! It's alarming how bad I am. I really don't think I could describe my own face to a sketch artist! Sounds like you would make a create witness. I'm sure you mean "great" witness and I agree. I'm always taking note of people I think look sketchy. Noting the times and so forth. Nothing yet but I'll be ready! Leftover spaghetti. It was delicious. Not as good as home cooked mom food though! Greek yogurt with tiny bits of pecans - gotta get my MUFA! I have stumbled upon the answer to this one! Oh- does that dinner look fabulous -- nice job! Actually, I've just had my sense of smell - therefore taste - restored by the skillful hands of a ENT after many years of not tasting. Not only would I totally enjoy the Andrew Henry dinner special (w/hip loving butter on the bread instead of good for me OO) - all the other food mentioned in the above comments sound delicious - EVEN the 3 cereal meal. May you all truly enjoy your culinary feasts no matter how uneventful they might sound! Congratulations on your newly restored smell and more importantly TASTE buds. You're welcome to come for dinner anytime!